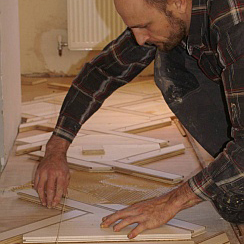 Are you looking to learn trade flooring skills? Are you motivated and eager to learn? Take a look to see if you can join the Heritage Flooring team. At Heritage Flooring, we appreciate the hard work and effort that goes into making a wood floor, especially as we see wood flooring as an art more than just a floor fitting. We are looking for others to join our team and help us create new visions, from fitting floors to other positions within the company as it grows. We also happily provide training from our experienced staff members to help build your skills from the ground up. Listed below are some of the vacancies available here at Heritage Flooring, feel free to browse and see if a position appeals to you. If it does, just fill in the contact form below and tell us about yourself and what you can offer to our team. We operate mainly from Kent and look for team members to either live or commute to us. If you already live in the Kent area, then it shouldn't be an issue! Applications are invited from people who already have skills, or who aspire to a high level of skills in woodworking whether they call themselves a cabinet maker, joiner or carpenter. Our ideal candidate would be intelligent, mature, physically fit, strong and will be willing to undertake the occasional heavy physical work involved in moving materials and tools. ...should be happy and optimistic. ...should be well presented and neat in attire and work practices. ...should have a background/experience in floor laying or carpentry. ...should be proud of their skills and knowledge in woodwork and be equally proud of the tools they work with. ...should always look to improve and do better. What we offer is a life of job satisfaction. You and your team mates will almost always be responsible for the creation of each floor from start to finish. You will be creating beautiful things, many of which will last for centuries. It is in the nature of the work that you will be working on projects alongside other high quality, highly skilled craftsmen in other trades. We make floors in marquetry, parquet and boards, so no two are exactly alike. We work in many different woods and we are constantly developing new patterns and new hardwood floor images. We will teach you a wide variety of new skills but we also hope to learn from you as well, so if you bring new skills absent in the company they will be well received. We are looking for eager people to work with us in making the best hardwood floors on the planet. Applications are invited from people who aspire to a high level of skill in woodworking - making fine board, parquet and marquetry floors. Our ideal candidate would be intelligent, mature, physically fit, strong and will be willing to undertake the occasional heavy physical work involved in moving materials and tools. ...should be self-confident and well spoken within any regional accent. ...should be eager to gain skills and knowledge in woodwork and be proud of the tools they work with. ...should expect to invest in building up your own hand tools for use during jobs. Large machine tools are provided by the company. ...should be a good time keeper, self-motivated and be able to work without supervision. ...should be happy working alone or as a member of a team. ...should be honest and trustworthy. It is in the nature of the work that you will be working on projects alongside other high quality, highly skilled craftsmen amongst the companies own staff and other trades on site. You will also never stop learning, so whilst it is expected you will have a good knowledge of your trade, we are masters of ours but we make no claim to know all there is to know. We are learning new things every day, constantly developing new patterns and new hardwood floor images. We will teach you a wide variety of new skills and we also hope to learn from you as well, so if you bring skills absent in the company they will be well received. Seen a job you like or a position you think you could fill? Well, contact us today by filling out the form below and we'll see if you will be a good fit for the Heritage Flooring team. Please state which position you're applying for also.